Individuals can join an e-mail list and receive an ecopy of the newsletter. You do not join SOPA as such, as it is not a membership body but an umbrella organisation. It gathers a range of views from other organisations with an interest in improving the quality of later life. See the SOPA Committee page for associated groups. The newsletters from September 2015 onwards are being emailed through Mailchimp. You will notice a different look. However you can still view the newsletter as a PDF file downloaded from this page. The newsletter can be enlarged on the screen. Use the plus or minus buttons in Adobe Reader (which appear when the document is opened) to adjust. Double click on the hyperlinks in the newsletter to open a link. Click on Back Button on the menu bar to return to the newsletter from the link. This newsletter is a 4-page version of the newsletter distributed by email to subscribers on our database. 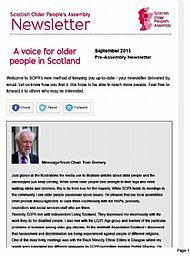 If you would like to subscribe to the SOPA newsletter and have a copy sent direct to your email on publication, send a message to glenda.watt@edinburgh.gov.uk. This edition highlights the successes SOPA has had recently in staging and contributing to events, and in attracting media interest, in particular, drawing politicians' attention to the soaring cost of funerals. September 2015 Newsletter - Click here to open. Read about the events ahead in the Scottish Parliament and an update on summer meetings around the country on the Campaign Trail to spread the word and gather opinion. Also new links to useful orgaisations. The best of them will be transferred to our Links page for future reference. 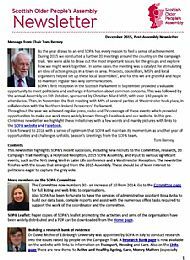 This edition highlights the progress SOPA is making on the Action Points agreed at the Assembly through a range of meetings and activities. 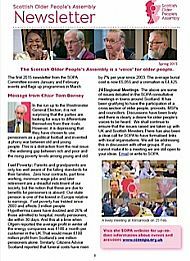 There is news of the Scottish Care Conference in June, the SOPA event in September in the Scottish Parliament and the 2015 SOPA Assembly date in October. The message from the Chair emphasises the importance of a stronger voice to protect the vulnerable from further cuts in financial and other support predicted under the Westminster government. This edition highlights developments during January and February including the way the Campaign Trail continues, but with new questions. 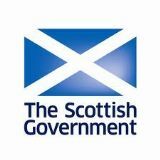 There is a link to the Scottish Government consultation on Funerals and Burials as it is agreed that the law is in desperate need of change. They want to hear from you and there is an online form to make it straightforward. 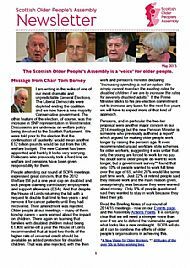 March events in the pipeline are highlighted and there is a message from the Chair as the approaching Westminster General Election encourages politicians to seek advantage by making older people a 'political football'.